Sea Glass in South Africa Anyone? 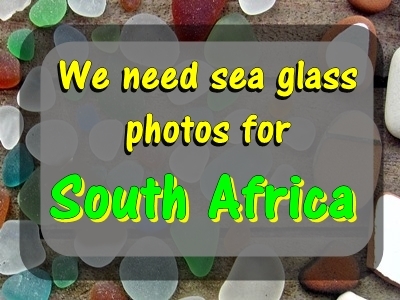 We need photos of South Africa sea glass! My name is Candice and I from Cape Town, South Africa. While visiting in the states i developed an interest in collecting sea glass off northern california beaches. I am really enjoying it but return home soon and was interested in hearing of any beaches that have been reported as holding sea glass in my area. I see on your list of countries mentioned, that South Africa is included. However, the name mentioned is Pretoria, a landlocked area of the country. I am sure that no SEA glass could have been found there, perhaps some other type of churned glass though. If you know of any beaches in South Africa that are known to "stock" sea glass then i would love to investigate them. I will surely let you know of my findings! Have you heard of any such beaches? Thanks for your nice note. I feel so embarrassed, as I used to be so good at geography. Previously, I had commented that Cape Town has got to have some decent sea glass beaches. Recently, Terra added photos of some very nice sea glass found near Cape Town at Bakoven Beach. You can see those photos and now we do know there is sea glass in the Cape Town area. What I will do is post your note to questions and see if we can get some more photos of sea glass in South Africa. Please let us know what you find there with photos if possible. and BE CAREFUL. Sea glass is addicting! Comments for Sea Glass in South Africa Anyone? Hi there, I have been collecting sea glass for about 2 years and have made many sea glass wind chimes also sea glass pictures etc. I have approximately 40kg. of undrilled sea glass, mainly white, green and brown. I would like to sell all of the above. Does anyone have a good suggestion on how I can distribute the above. Hello am Solomon from Nigeria happy to hear that sea glass found in South African. I will like to use this medium to tell whoever concern tt we found great pieces of sea glass in Nigeria. We would love to see photos of your sea glass from Nigeria! I work with the Street Children in Durban. They collect sea glass for me. We use it for making sun catchers etc. I only have photos of what they have collected of South Beach. Im also trying to help them find an outlet to sell their sea glass. Lots of good comments, no photos? Thanks to all for your comments and recommendations. We really need some more photos so that viewers know what is being found where. We visited La Lucia beach, about 15km north of Durban, last week. I found some sea glass on the beach, but only the ordinary brown, green and transparent (white). As you mentioned, it is addictive! I found lots of seaglass recently in Durban . This morning Iwas collecting sea glass on the beach in Durban between the Suncoast hotel and the Blue Lagoon. Go at low tide. There is quite a bit. I'm glad there are fellow collectors. I currently live in South Korea and I collect here, but I grew up in Strand, Western Cape. You will find sea glass on the beach where they permit dogs, in Strand. Between the pier and where beach road turns up towards R44 closer to Gordon's Bay. There's a huge hotel on the corner. Those beaches are rocky and I have found seaglass there. Blue is hard to find but plenty brown and green. We should stay in touch. When I am home in March we can go collecting together. Whilst Ivan left a comment on this site wishing to sell his sea glass and pottery shards, I have tried contacting him both via email and cell to no avail. Needless to say I am deeply disappointed. If there is anybody else in South Africa who is looking to sell sea glass please let me know urgently. Hi I am in Pretoria South Africa but lived in the Eastern Cape for some time and came across a sea glass collector that was wanting to buy a yacht and travel the world and for that reason gave a abundance of sea glass and sea pottery shards to me .....me being a jewelry maker and artist he just wanted to give it to someone who could use and appreciate it. Hi, since a recent trip to an island off Mozambique, I have fallen in love with sea glass (they used it in all their decor which was absolutely stunning). But unfortunately there is none available in Durban and surrounds that I am aware of. Hence I am looking to BUY some locally. Do you have any idea who sells sea glass in South Africa? Or internationally for that matter? I'm desperate to start on some sea glass projects. Any ideas? I was shocked at the abundance of good sea glass. I ran around grabbing glass from all over until I realized it would weigh down my luggage too much. Sadly, there are a lot of vagrants and homeless people on this beach. It's perfectly safe during the day but I would recommend wearing closed shoes on this beach. Three Anchor bay has some very nicely rounded green and white pieces. Have found some blue-green pieces there too. Cosy bay between Camps Bay and Hout Bay has beautiful white sea glass. And interesting bits of porcelain too. I actually do not have much of an idea as to where we can get sea glass. But one of my friends working in the coastal department can actually help us I guess. I have already asked him about this. He said he will reply to me shortly. Lots of sea glass can be found on the pebble beach at The Heads, Knysna. Green, Brown and White with odd findings of shades of pink. No blue found during regular visits over a seven-month period. Coney Glen Knysna also good for sea glass. Same colours found at Victoria Bay, near George. Mossel Bay where the tidal pool is located and surfers beyond the rocks at The Point. This area at low tide down the stairs from the parking lot is good for sea glass and wonderful for pickings of shells and shell texture, colour and shape pieces. Can 'sit' for hours sifting through the shelly sand.